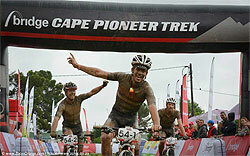 The significant prize money purse as well as the high quality race environment at the 2014 Bridge Cape Pioneer Trek will be unaffected despite the recent decision by Bridge, the event’s title sponsor, to apply for business rescue, according to Race Director, Henco Rademeyer of Dryland Event Management, the company that owns and organises the Bridge Cape Pioneer Trek. The sixth edition of the seven-day international mountain bike stage race in South Africa’s Western Cape province has attracted a strong field, which includes a number of current and former national, continental and world champions and a total of over 400 riders from 15 countries. Bridge, a provider of short-term unsecured credit, decided in early September to apply for business rescue as a result of, among of factors, the rapid deterioration of confidence in the unsecured lending industry following the placing of a major player into curatorship. The business rescue process allows for a legal framework to restructure Bridge to enable it to continue as a sustainable business. “We have been in contact with all our sponsors over the past two weeks and I can confirm that the 2014 edition of the Bridge Cape Pioneer Trek will not be affected on any level and will go ahead as planned with all the relevant rider benefits and prize money,” said Rademeyer on Monday. “The decision by Bridge to honour its commitment to the race in particular and mountain biking in general is to be respected and appreciated. “We have a very committed group of sponsors who work with us closely to ensure our events continuously deliver the highest standards. Besides Bridge, our title sponsor, Klein Karoo International, Fairview, Wilde Juice, Cape Brewing Co, 32GI and Giant bicycles are all headline and partner sponsors at the Bridge Cape Pioneer Trek. “Another important aspect of the Bridge sponsorship of the Cape Pioneer Trek is that they have allowed us to retain our tone as an event that’s challenging, but sympathetic. We do our best to make every participant - be they a world champion or a weekend warrior - feel like an important part of the event. It’s one of the reasons we get so many returning participants each year,” added Rademeyer. 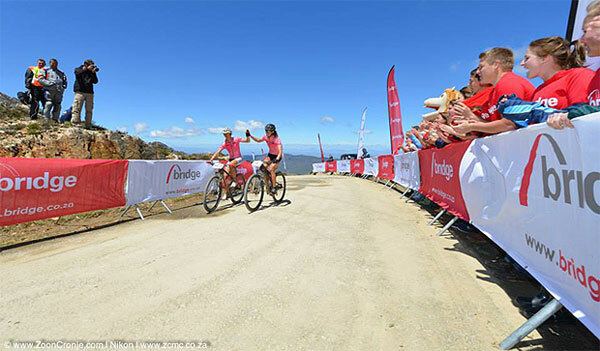 Since 2012 when it took on the Cape Pioneer Trek in a five-year sponsorship agreement, Bridge has given the event a significant boost, particularly in the prize money department, which has helped the race secure International Cycling Union (UCI) grading status. Bridge has also been responsible for increasing the women’s category prize money at the Cape Pioneer Trek so that it is equivalent to what the men earn. The total prize money for all categories for the 2014 event is over R450 000 (approximately US$45 000). The ostrich is the fastest thing on two feet, reaching speeds of up to 70km/h.